For two years, Donald Trump has achieved a remarkable political feat. One could criticize him for governing only his political devotees rather than governing the entire American public. But in doing so, he secures the unwavering support of his base. Although Trump’s administration has never achieved an approval rating exceeding 50 percent, the president has always maintained public support of at least 35 percent. The resilience of Donald Trump’s supporters is truly remarkable. They don’t seem to be fazed by the everyday revelations surrounding the Russia probe, the scandals affecting the Trump administration, the pathologically deceptive behavior of the president or his erratic style of governance, again demonstrated by the long-term government shutdown. With any other president, a single one of these incidents would have caused an irreversible drop in his approval rating. Yet, Trump’s supporters don’t cave, no matter the nature of the controversies surrounding the president. How can we explain this unusual phenomenon? It would be easy to conclude, as many American political commentators have done, that supporters are ignorant, politically naïve, gullible or simply stupid. Such an explanation is overly simple. The reality is much more complex. One explanation stems from the fact that Trump supporters’ perception of reality is fed largely by the constant flow of content from Fox News and the far-right network Breitbart. These two hyperpartisan media outlets unconditionally support Trump and support the perception that all the unsavory scandals and revelations surrounding Trump are nothing more than “fake news” spread by the mainstream media. In short, Trump’s supporters seem to be suffering some sort of brainwashing. Such an explanation is still insufficient. Some political scientists have tried. They have created “fake news” and tried to entice liberal groups. That has not worked; the experiment has never taken hold, and the latter have always seen through the ploy. But contrary to the impression that’s generally conveyed, Trump supporters do not come mostly from a noneducated working class that tends to be more susceptible to Trump’s populist rhetoric about the loss of manufacturing jobs and competition stemming from immigration. The majority of low income workers tend to vote Democratic. In fact, the majority of Trump supporters are white men with a college or university education who make between $50,000 and $200,000 per year. In short, Trump supporters are part of the white middle class. How can educated people demonstrate so much political ignorance, adhere to [Trump’s] populist rhetoric, reject obvious facts and blindly accept the president’s lies? To explain this unwavering support, Dan Kahan, professor of law and psychology at Yale, relies on the theory of cultural cognition. According to that theory, facts count much less than the search for identity, shared values and the social circles in which individuals gravitate. According to Kahan, individuals have a tendency to conform their convictions about controversial issues to the values that define their cultural identities. In doing so, these individuals are able to adopt completely false political opinions all the while sincerely believing they are based in fact. Further, Kahan claims that the concept of honesty includes such a hodgepodge of beliefs, pious wishes and stereotypes that the adherence of a candidate to empirical facts is not really pertinent in measuring his honesty. Yet, because Trump joyfully mocks political integrity based on facts, many individuals find his behavior to be frank and authentic, thus confusing it with honesty. As a result, individuals, above all those who are more worried, limit their sources of information to those that fit into their comfort zone and seek to reshape reality according to their needs. In sum, Trump supporters continue to take the bait and swallow the “fake news” propagated by the president because his rhetoric reassures them of their cultural identity. Kahan thus confirms the theory of self-deception used in psychoanalysis, according to which individuals develop unconscious methods of diminishing their loss and anxiety in the face of an uncomfortable reality. Yet, in defending their identity, they have a tendency to identify a particular leader and idealize him. In the process of idealization, they have a tendency to overestimate his qualities and underestimate his faults. In doing so, they project their needs and their desires on that person. 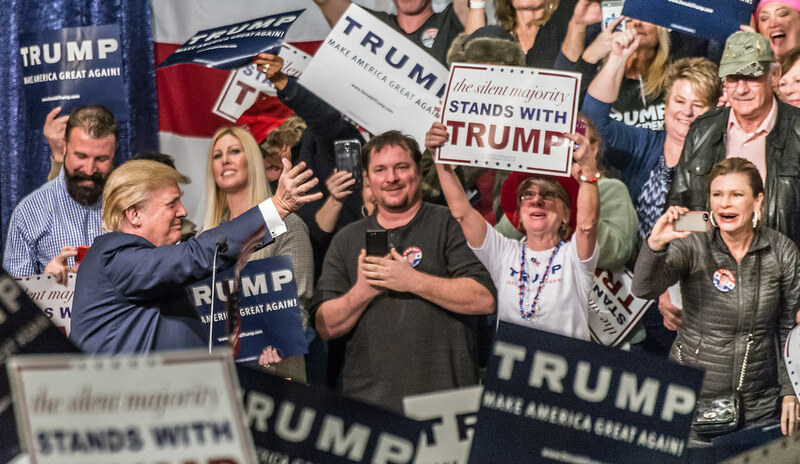 The unwavering support exhibited by Trump supporters can therefore be explained from the viewpoint of self-deception; the supporters efficiently bury disagreeable truths as a psychological defense mechanism. Yet, Trump has so far learned how to skillfully feed the fears of his supporters for his own political gain. Gilles Vandal is professor emeritus at Sherbrooke University School of Applied Politics.